When TNA Impact Wrestling superstar MVP isn’t running around the ropes inside the squared circle, he Miami born pro wrestling can be found on the mats rolling and avoiding submissions. 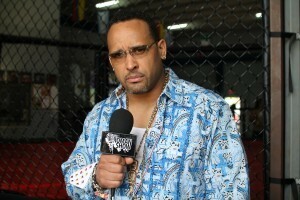 In an interview with The Roman Show, MVP says he is currently the owner of a blue belt from Gracie Barra in Texas. MVP will be in action teaming up with The Wolves Eddie Edwards and Davey Richards and Jeff Hardy against Team Dixie Austin Aries, team captain Bobby Roode and The BroMans Robbie E and Jessie Godderz for control of TNA at the TNA Lockdown pay-per-view on Sunday, March 9 at the BankUnited Center at the University of Miami, 1245 Dauer Dr. in Coral Gables. Doors open at 6:30 p.m., and tickets are on sale. The show airs on pay-per-view at 8 p.m. EST. Tickets are on sale, now. And it doesn’t stop at the blue belt, as MVP says he wants to pursue higher ends in jiu-jitsu. He also said that if his career in wrestling wouldn’t have lifted, the thought of becoming a fighter was an option. MVP also discussed coming back home, what changes he will bring if he were to be victories at TNA Lockdown, eating Cuban food and more. For TNA Lockdown card, click here. Previous: Gail Kim is steel cage ready!